The main event has been the French election which has caused the sudden growth of EURUSD. The support rests at 1.08240 with resistance at 1.08900 which both lines are above the weekly pivot point at 1.07010. The EMA of 10 is moving with bullish bias along the ascendant channel and it is above the EMA of 100 and the EMA of 200. The RSI is moving horizontally in the overbought area, the Stochastic is showing upward momentum and the MACD indicator is in positive territory. The ADX is not showing any clear signals. All these bullish signals have been created due to the market shock therefore things will get back to normal soon. 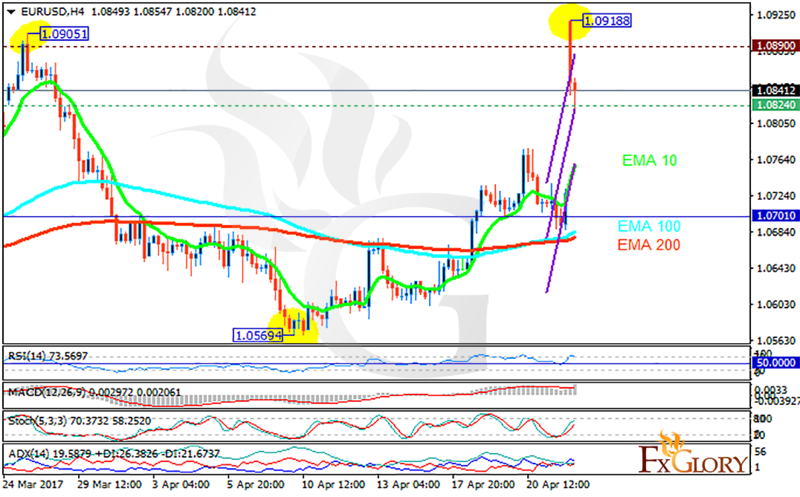 Short positions are recommended targeting 1.0650.